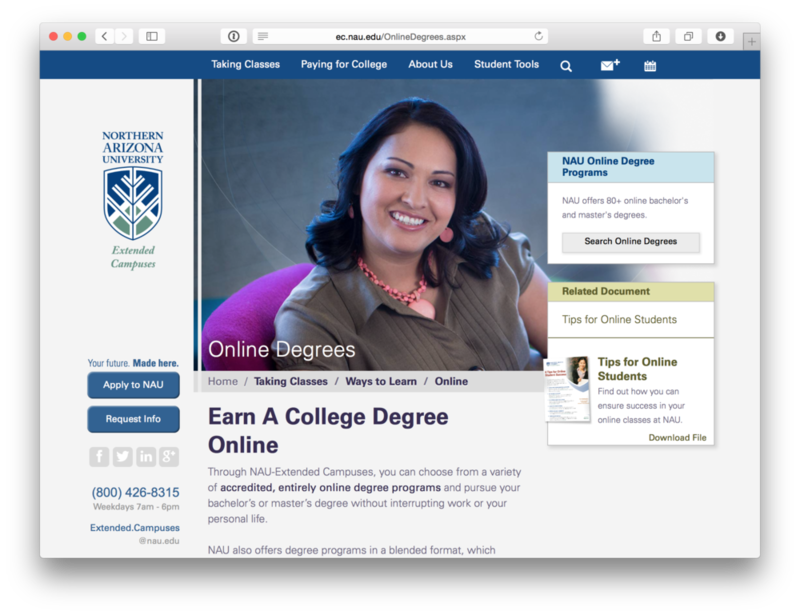 The Extended Campuses of Northern Arizona University (ranked Best Online College for 2015 by BestCollegeReviews) manages all of the University’s remote learning, both online and in 38 campuses around the state of Arizona. In 2013, I managed the redesign of our public website: information architecture, function, and aesthetic design, in coordination with our new identity effort. The redesign is fully responsive, easy to maintain through the University’s CMS, and strongly communicates the Extended Campuses brand to prospective and current students, press, and business partners. Responsive design for information-dense applications is challenging. I’m particularly proud of our Degree Search and Calendar pages, which maintain usability and complex function across devices. One other interesting aspect of the site is a system of “information plumbing” which allows new content from blogs, events and uploaded documents to automatically populate sidebar widgets on relevant pages of the site. 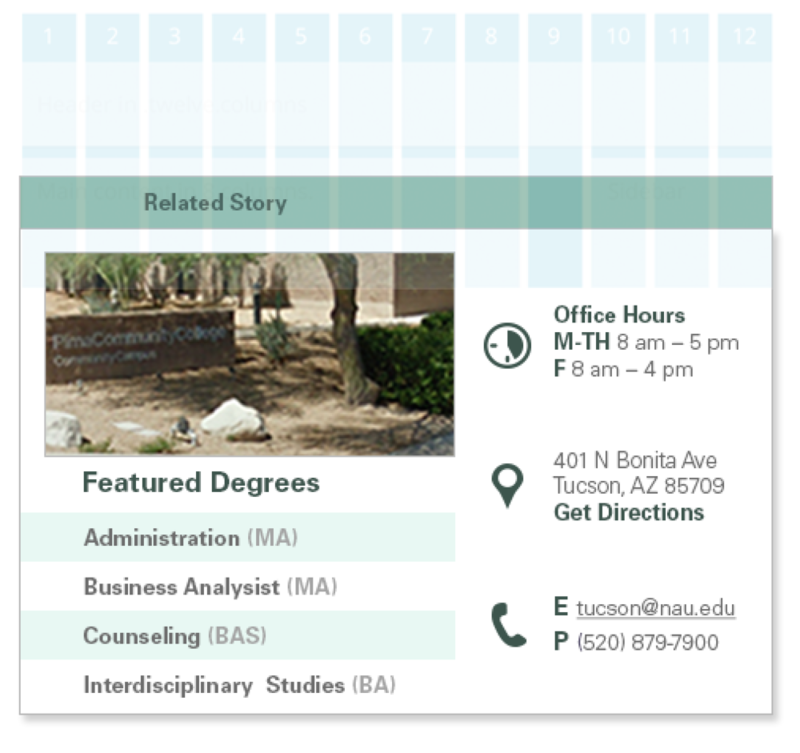 For example, if Marketing posts a new story related to our Yuma campus, the Yuma page will automatically sprout a widget displaying this story for a certain number of days, then the widget will disappear again. This keeps site content fresh and relevant with minimal maintenance. News Stories, Documents, Events, as well as Degree and Campus information, dynamically populate the website so content always remains fresh. Photoshop comp of a news widget. Comp displaying specifications for the various “families” of widgets which populate site pages. 12-column responsive grid and color guidelines for the various widget “families”. Color guidelines for various widget “families”. In order to test the structure, I arranged a series of card-sort tests, in which each category is printed on an index card and testers are asked to group cards into logical categories or guess which page might contain a function. These tests were administered to faculty, staff, students, and strangers with no knowledge of NAU. Because this involved formal research, I coordinated with NAU’s Institutional Review Board to make sure all testing was performed in an ethical manner, and arranged for compensation (snacks, NAU-branded water bottles) to be offered to participants as a small thanks for their time. Results were evaluated manually, and using OptimalSort to provide additional insight. 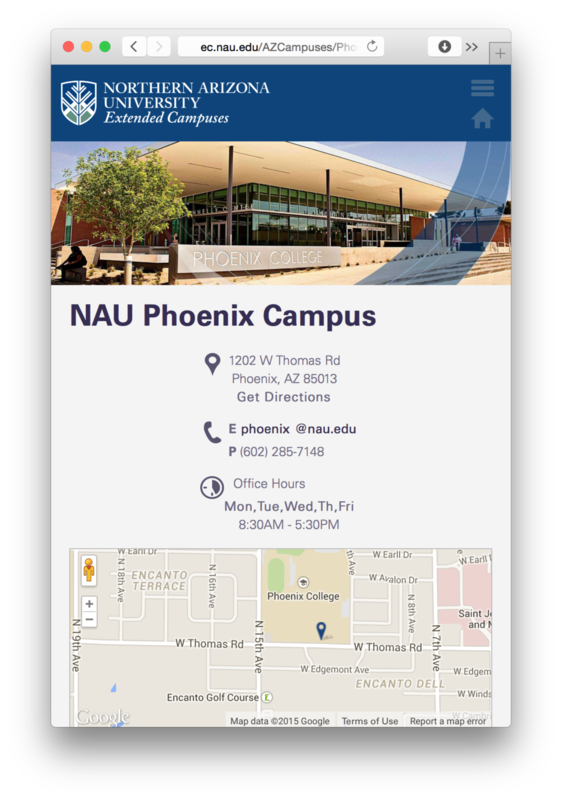 We made several adjustments to the architecture, and ended up with a clean navigation which has served us well not only on the primary EC site, but on subsequently-created sites related to specific campuses and programs.